Right-angle plugs on both ends allow easy access to jacks with minimal clearance. Format: MISC ACCESSORY. 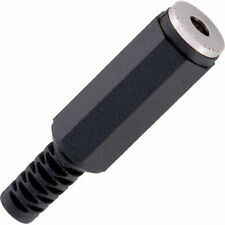 Nickel-plated plugs for rugged durability and efficient signal transfer. You should see the option when you check out. 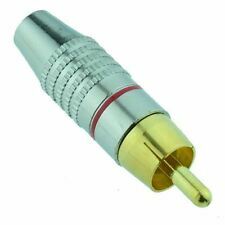 Red Gold Plated RCA Phono Plug Straight Audio Video. 5 x Black Gold Plated RCA Phono Socket. 5 x Yellow RCA Phono Socket Connector. 4 x RCA Panel Mount Sockets - Red, Black, White, Yellow. 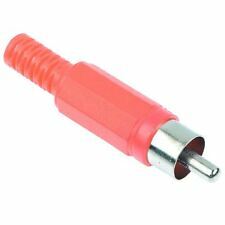 10 x Red RCA Phono Plug Connector. A good quality, robust phono socket designed for direct mounting on printed circuit boards. When mounted, the phono socket will connect parallel to the board. Great range of products. Everything you need for your Electronics Project from one supplier. 5 x Red Gold Plated RCA Phono Socket. 10 x Black RCA Phono Plug Connector. Red Gold Plated RCA Phono Socket Straight Audio Video. 10 x Black RCA Phono Socket Connector. 5 x Male RCA Phono Plug Screw Terminals. 5 x Black RCA Phono Socket Connector. Connectors: 1/4 in TRS to Dual RCAF. This cable is designed to split a stereo signal. Black- and red-coded phono jacks indicate left and right respectively. It may also be used in reverse. You should see the option when you check out. 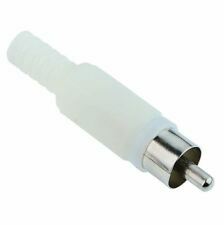 10 x White RCA Phono Plug Connector. 10 x Red RCA Phono Socket Connector. 5 x White RCA Panel Mount Socket Nickel Plated. KYCON HSP-212V-08 RCA PHONO DUAL CONNECTOR ARJ-3100-2 HSP-212V BOX 627. 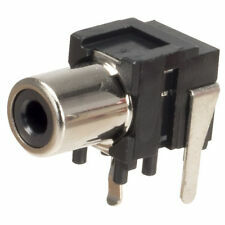 Black RCA Right Angle PCB Phono Socket. White RCA Right Angle PCB Phono Socket. Yellow RCA Right Angle PCB Phono Socket. Connectors: 3.5 mm TRSF to Dual RCA. This cable is designed to split a stereo signal. Black- and red-coded phono plugs indicate left and right respectively. You should see the option when you check out. Gold, Red, White. During that process you will be issued with an RMA number. 5 x Yellow RCA Panel Mount Socket Nickel Plated. 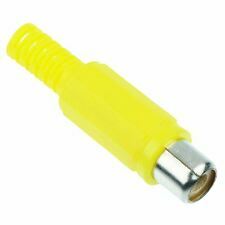 10 x Yellow RCA Phono Socket Connector. Connectors: RCA to Dual RCAF. This cable is designed to duplicate a mono signal. You should see the option when you check out. Manufacturer's part 72207. Plastic cable mounting mono jack socket from BKL. Number of pins 2 /mono. Straight socket. Solder connection. During that process you will be issued with an RMA number. Images shown are for demonstration purposes. 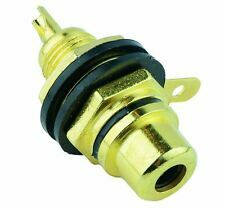 10 x Yellow RCA Panel Mount Socket Nickel Plated. 10 x Red RCA Panel Mount Socket Nickel Plated. 10 x White RCA Panel Mount Socket Nickel Plated. High Quality 75 Ohm Coaxial Cable RG59U. High quality leads with Phono (RCA) type plugs for RGB video connections. Phono type Plugs. 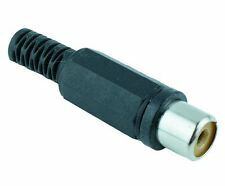 Connector A: Phono (RCA) Male. Connector B: Phono (RCA) Male. However they can also be used as audio leads, 2 could be used to connect left and right stereo sound. 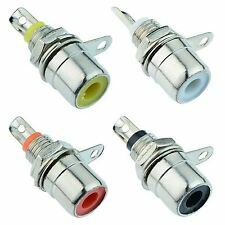 High quality leads with 3x Phono (RCA) type plugs for RGB video connections. Phono type Plugs. Connector A: Triple RCA Male. Connector B: Triple RCA Male. If you require a stereo audio cable only, these three way cables are easily split down should the third video lead not be required. Red RCA Right Angle PCB Phono Socket. 5 x Black RCA Phono Plug Connector. Connectors: 1/4 in TRSF to Dual RCA. This cable is designed to split a stereo signal. Black- and red-coded phono jacks indicate left and right respectively. It may be used to adapt a stereo cable with phono plugs to a stereo phone jack. 5 x White RCA Phono Socket Connector. 5 x White RCA Phono Plug Connector. 5 x Red RCA Phono Plug Connector. 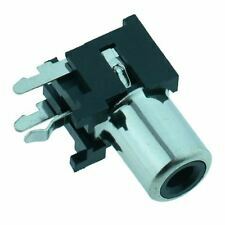 10 x Black RCA Panel Mount Socket Nickel Plated. 10 x White RCA Phono Socket Connector. 5 x Red RCA Panel Mount Socket Nickel Plated.